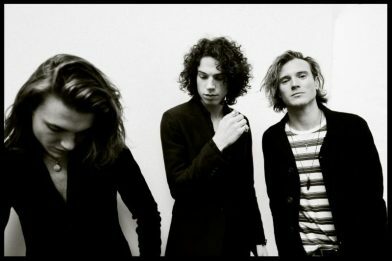 Dougie Poynter, Todd Dorigo, and Corey Alexander have announce new alt-rock band INK. With debut EP ‘HEAVEN’ available now on all streaming platforms. London-based Alt-Rock trio, INK. has today released its debut EP, ‘HEAVEN’. Founded by Dougie Poynter(formerly of platinum selling UK bands, McFly and McBusted) andTodd Dorigo (former solo artist who has previously played Glastonbury and toured with Carl Barat of The Libertines) and completed by the addition of drummer Corey Alexander, INK has drawn from a variety of influences ranging from The Rolling Stones, Nick Cave, The National, and Nirvana to the writings of Alan Ginsberg, Vladimir Nabokov, Leonard Cohen, and Jack Kerouac. In its first musical offering, the 4-track ‘HEAVEN’ EP, the band clearly demonstrates its song-writing flair. Dorigo’s deep, velveteen voice and intricate guitar work, coupled with the phenomenal rhythm section of Poynter’s melodic bass lines and Alexander’s epic drum sound, blend their expansive influences into a maelstrom of stirring and skilfully crafted rock songs.